Do you live in Newmarket? Aimee Tomlinson Reviewed by: LY GFA She is very knowledgeable, helpful and skilled. I would definetly recommend her. Top quality work! Newmarket's Old Town Hall – Situated in the historic Main Street area. Newmarket is a town in York Region in the Canadian province of Ontario located north of Toronto. It is part of the Greater Toronto Area and Golden Horseshoe of Southern Ontario. 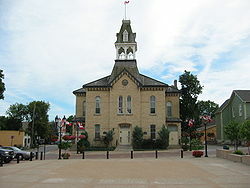 In the Canada 2011 Census, the municipal population of Newmarket was 79,978. It is the regional seat of York Region. Many Newmarket residents commute to Toronto and its surrounding communities. Some of Newmarket's most noticeable landmarks are the Upper Canada Mall, Southlake Regional Health Centre, Main Street Heritage Conservation District, the Fairy Lake Conservation Area, as well as many other parks and recreation areas. In 2013, MoneySense magazine ranked Newmarket 10th out of 200 cities in Canada, and 4th out of the "Top 10 Small Cities" in Canada in its "Canada's Best Places to Live in 2013". Newmarket's geographical coordinates are 44.05°N, 79.46°W, and its elevation above sea level is 239 m. It has an area of 38.33 km². The town is bounded on the south by Aurora, on the west byKing, on the north by East Gwillimbury and on the east by Whitchurch–Stouffville. There are two reservoirs in Newmarket; Fairy Lake (which is managed by the Lake Simcoe Region Conservation Authority), a favourite recreational area in the centre of town, is a former mill pond on the East Holland River; and Bogart Pond, also a former mill pond, is fed and drained by Bogart Creek in Bogarttown. Furthermore, the water level in the reach of the East Holland north of Davis Drive is controlled from an unfinished Newmarket Canal lock, now used as a weir. The land is characterized mainly by glacial deposits from the last ice age, known as "Newmarket Till". The town is underlain mainly by sand and gravel, ground by the icesheets that covered the area until about 10,000 years ago. No outcrops are to be found anywhere in Newmarket, so deep are the glacial deposits. The John Bogart House on Leslie Ave is the oldest residential structure in Newmarket, and the oldest two storey residential building north of Toronto. It was built in 1811 and still serves as a house today. Newmarket's location on the Holland River long ago made the area a natural route of travel between Lake Ontario and Lake Simcoe. A majorportage route, the Toronto Carrying-Place Trail ran one of its two routes down the Holland, through the Newmarket area, and over the Oak Ridges Moraine to the Rouge River and into Lake Ontario. A more used route ran down the western branch of the Holland River, over the moraine, and down the Humber River. In 1793, John Graves Simcoe travelled the trail, northward along the main route to the west, and south to York (nowToronto) along the lesser used eastern route though Newmarket. Selecting the eastern route as the better of the two, Simcoe started construction of Yonge Street along the former trail in late 1795, starting in York in Toronto Bay, and ending at the newly named St. Albans (Holland Landing), north of Newmarket. In June, 1800, Timothy Rogers, a Quaker from Vermont, explored the area around the Holland River to find a suitable location for a new Quaker settlement. Some of the United States Quakers were interested in moving northward, disturbed by the violence they were expected to take part in during the American Revolution. In 1801 Rogers returned along with several Quaker families who had left their homes in Vermont and Pennsylvania. By the Christmas of 1801, Joseph Hill had constructed a mill on the Holland River, damming it to produce amill pond that is now known as Fairy Lake. The town of "Upper Yonge Street" sprouted up around the mill, which explains why its primary downtown area was centred on the Holland River, and not on the nearby Yonge Street. Hill also built a tannery just to the north of the mill, and the first store and house, as well as additional mills. By 1802, Elisha Beman had begun to establish businesses and buy land in Newmarket. A mill was first and other businesses (including a distillery) soon followed. The town continued to grow through the early 19th century, along with the formation of Aurora and Holland Landing, and a market held in the current downtown location gave rise to the name "Newmarket". Newmarket played a central role in the Rebellion of 1837. The Town was a focal point of discontent against the manipulations of the governing Family Compact, of whom it was said "were robbing the country". Rebel leader William Lyon Mackenzieorganized a series of meetings leading to the Rebellion. During the first of these meetings, on August 3, 1837, Mackenzie delivered his first campaign speech from the veranda of the North American Hotel at the corner of Botsford and Main Streets. This speech is largely credited for being the initial spark to the rebellion as it was heard by about 600 farmers and others sympathetic to Mackenzie’s cause, who later that year armed themselves and marched down Yonge St. to take the capital. A number of leaders from this area were later attainted for high treason, convicted and hanged. Newmarket was incorporated as a village in 1857 with a population of 700. In 1880, with a population of 2,000, Newmarket became a Town and William Cane was elected as its first mayor. In later years Cane's sash and door factory became the first in Canada to manufacture lead pencils. In 1858, Robert Simpson co-opened "Simpson & Trent Groceries, Boots, Shoes and Dry Goods" in downtown Newmarket, the first store in what would become the Simpsons department store chain. In June 1853 the first train pulled into Newmarket on the Toronto, Simcoe & Lake Huron Union Railroad, the first railway in Upper Canada. It eventually linked Toronto to Collingwood on Georgian Bay, a major shipbuilding centre. Today, this line is the "Newmarket Subdivision" of theCanadian National Railway system, running north out of Newmarket towards Bradford, and south towards Toronto. In 1899 the Toronto and York Radial Railway arrived in Newmarket. This operated along Yonge Street south of Newmarket, but turned east to run through the downtown area along Main Street; it would later be extended north. At the time, it brought significant numbers of day-trippers to Newmarket to shop at the market. Automobile traffic on Yonge Street, and the already existing mainline railway, had a significant effect on ridership, and the Radial was discontinued in the early 1930s. North of Davis Drive in Newmarket, the East Holland River was straightened to prepare it for use as a commercial waterway to bypass the railway, whose prices were skyrocketing around the turn of the 20th century. Sir William Mulock, the local Member of Parliament, proposed a canal system running down the Holland River through Holland Landing and into Lake Simcoe. This would allow boats to connect from there to the Trent-Severn Waterway for eventual shipment south. The canal was almost complete by the summer of 1912, when it was cancelled by the incoming government of Robert Borden. Today, the locks are still visible and are known as the "Ghost Canal". The turning basin in downtown Newmarket was filled in and now forms the parking lot of The Old Davis Tannery Mall, on the site of the former Hill tannery. For much of the 20th century, Newmarket developed along the east-west Davis Drive axis, limited to the area between Yonge Street on the west and between Bayview and Leslie Street in the east, and running from just north of Davis on the north to the Fairy Lake area on the south. By the 1950s, Newmarket was experiencing a suburban building boom due to its proximity to Toronto. The population increased from 5,000 to 11,000 between 1950 and 1970. The construction of Upper Canada Mall at the corner of Yonge Street and Davis Drive in 1974 started pulling the focal point of the town westward from the historic Downtown area along Main Street. By the early 1980s, the original historic Downtown area suffered as most businesses had built up in the area around Upper Canada Mall, with additional strip malls developing directly across the intersections to the south and southeast. A concerted effort to revitalize the historic Downtown area during the late 1980s was successful. More recently, a $2.3-million investment was made by the Town in 2004 in streetscaping and infrastructure improvements to roads and sidewalks in the historic Downtown. The historic area of Downtown's Main Street is once again a major focal point of the Town. The arrival of Highway 404 reversed the westward movement, pulling development eastward again, and surrounding the formerly separate hamlet of Bogarttown at the intersection of Mulock Drive and Leslie Street. Since then, Newmarket has grown considerably, filling out in all directions. The town limits now run from Bathurst Street in the west to Highway 404 in the east, and from just south of Green Lane to just north of St. John's Sideroad, taking over the former hamlet of Armitage at Yonge Street south of Mulock Drive. The outer limit of the Town is contiguous with Aurora to the south. Armitage was the first settlement of King, named in honour of its first settler Amos Armitage. He had been recruited by Timothy Rogers, a Loyalistfrom Vermont, who in 1801 had travelled along Yonge Street and found the area appealing, and so applied for and received a grant for land totalling 40 farms, each of 200 acres (0.8 km2). Other defunct communities once located within the modern boundaries of Newmarket include Garbut's Hill, Paddytown, Petchville, Pleasantville, and White Rose. For over 100 years, the town's downtown area, centered around Main Street, has acted as a hub of commerce and cultural activity. This area contains numerous early 19th Century buildings worthy of preservation, and in October 2013, this area was recognized as a Provincial Heritage Conservation District. This status serves to protect and officially recognize many of the heritage sites and buildings along this historic thoroughfare and its many side streets.